After an initial series of praise and being liked by the players despite the weird peer-to-peer connection system, For Honor by Ubisoft is starting to attract more and more controversies. First it was only the connection method, which can attract hackers and compromise the security of players’ networks, now it is the gearing and “pay-to-win” present in the game. First, let’s take a look at how Rainbow Six: Siege handles progression and unlocks, because that is another Ubisoft game following a similar model. Siege is also a full-priced game, just like For Honor; the base price of the game is $60 / €60. There is also a Season Pass for about $40 / €40, which gives players Renown bonuses (equivalent of Steel on FH). When players purchase Siege, they have no Operators unlocked; they have to play the tutorial, single-player Situations and watch few tutorial videos to earn Renown, enough to unlock 4-5 Operators. The base-game Ops cost 500 to 2000 Renown points, and all ones added after game release cost 25,000 Renown. Ubisoft themselves have stated that unlocking a DLC operator takes about 40 hours of matches played. One match in Casual lasts about 15-20 minutes tops; winning gives 250-300 Renown, losing gives half. There are also daily challenges for 150 Renown each, and weeklies which give 250 or so. Once you get an Operator, he or she is yours; there is no leveling up or anything of the sort. You can unlock various attachments for their guns at 150-250 each, but these are only sidegrades which modify some parameters of their weapons; they might give slight advantages to players depending on their playstyle, but there is no vertical progression there. Finally, you can purchase headgear, weapon camos and skins for either real money or Renown points; these are purely cosmetic. Now let’s take a look at how For Honor does progression. Clearly, it takes influences from Siege; base game is $60 / €60, there is a Season Pass for $40 / €40, and also an in-game earnable currency similar to Renown in Siege; the currency here is called Steel. It is earned in the same way as Renown – dailies, weeklies, and playing matches. However, here is a stark difference between how Siege and For Honor handle playable characters. In the latter, all Heroes are available to play from the get-go; unlocking those costs 1000 per Hero, but this only unlocks the ability to earn levels on them and customize their gear. Yet this is where the controversy stems from. Gear has stats in addition to looks, and as a Hero gets more and more levels, the gear dropped for them also increases in power. Gear can be earned as random drops at the end of matches, and also from chests bought by spending Steel. And Steel can be bought with real money, so you can see where the issue is coming from: RNG-based gear drops everywhere, and if you get lucky drops on a high-level Hero, you can easily annihilate beginners and players who are trying out a new Hero. This heavily discourages players from focusing on more than 2-3 Heroes; and according to Damien Kieken, the game’s director, “you are not meant want them all”. He stated this on one episode of the weekly Warrior’s Den livestream. You can read his statement more in detail here. Now let’s think about this for a second. There are several game modes in For Honor: 1vs1, 2vs2 duels, Skirmishes, Elimination and Dominion (the latter three are 4vs4). Gear only matters in the 4vs4 modes; 1vs1 and 2vs2 mode feature equalized stats. And since For Honor’s competitive modes are the latter two, you can just jump in with any character and play, regardless of their level or gear, since it won’t matter at all. Siege’s model is still better in this regard – if you want a specific look for one of your favorite Operators, just go to the store and buy it for real money or Renown. You can’t do that in For Honor, where you have to pray for random drops. 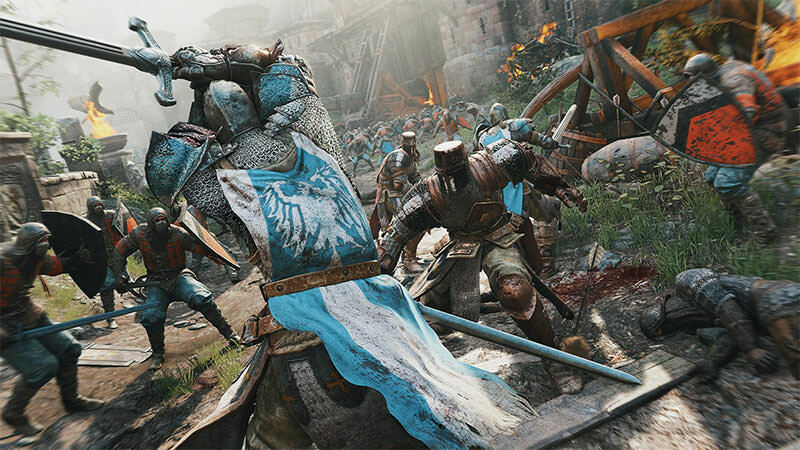 But the controversy still stands true – the issue is that it is not only relevant to For Honor, but many multiplayer games in general. The difference is between how developers set up earning such rewards and how they balance it with players who pay real money to skip the grind. Just look at the Battlefield games – you can either focus on specific classes or vehicles to get unlocks faster, or outright pay some $30 or so and unlock them instantly. Same goes to Siege, Ubisoft’s other multiplayer-focused game – you can outright buy the Operators introduced after the game’s release for real money, instead of grinding 25,000 Renown for them. This is just a general trend in the gaming industry, and it works – or else devs and publishers would turn to other methods. But at least in these games, players can pay with money or time to get the same results, while in For Honor, buying Steel only lets you earn more random chests, from which you won’t know what you will get.